Here at Austin Film Festival, we are constantly impressed by the accomplishments of the creators that attend AFF and are positively chuffed when these writers and filmmakers continue to garner success and accolades post-fest. This past year was no exception, evidenced by last Sunday’s Golden Globes, which felt like a reprise of the 2017 Austin Film Festival. 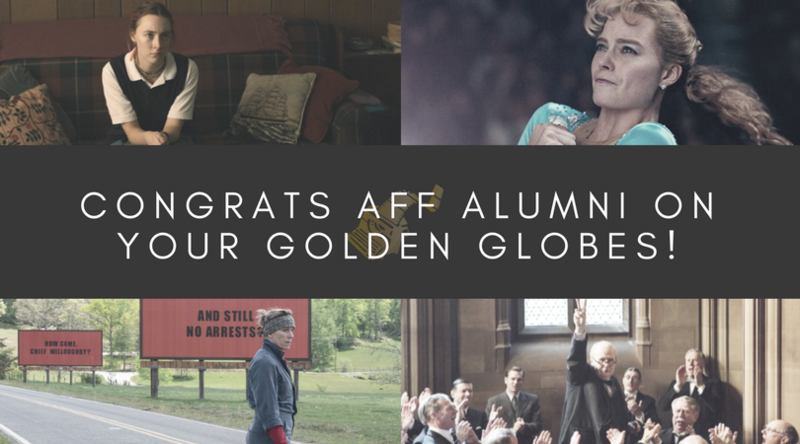 We’re so proud of the AFF films that received Golden Globes this year, including our Opening Night film Lady Bird, written and directed by the talented Greta Gerwig, which won Best Musical or Comedy Motion Picture as well as an acting award for Saoirse Ronan. (Click here to download the Lady Bird episode of the On Story® podcast). Other AFF winners include Three Billboards Outside Ebbing, Missouri, which won Best Drama Motion Picture, Best Screenplay, and acting awards for Frances McDormand and Sam Rockwell, Darkest Hour, which received an acting award for Gary Oldman, and I, Tonya, which earned an acting award for Allison Janney (who was kind enough to thank the film’s writer and AFF alum Steven Rogers in her acceptance speech. Congrats to all of the winners, and good luck as the Award Season continues. Be sure to get your badge to the 2018 Austin Film Festival to see next year’s award winners before everyone else! If you missed these films at the festival, be sure to catch them in theaters!